Local Delivery - $12.00 (Charges vary for surrounding areas). Allow 24 hours when ordering. Minimum order of 8 people. We use Environmentally Friendly disposable place settings. Napkins and Utensils available upon request for an extra 15%. Please don't panic, we can do it! Want Treat by Karine's to really wow your guests? Please note that prices are subject to change due to yummy ingredient availability! Crisp garden fresh vegetables served with one of our homemade dips. Dip Choices: Bomba or Hummus or Babaganouj or Labneh or Sour cream with Dill. Extra dip portion $9.50 each. When is the event you're holding taking place? 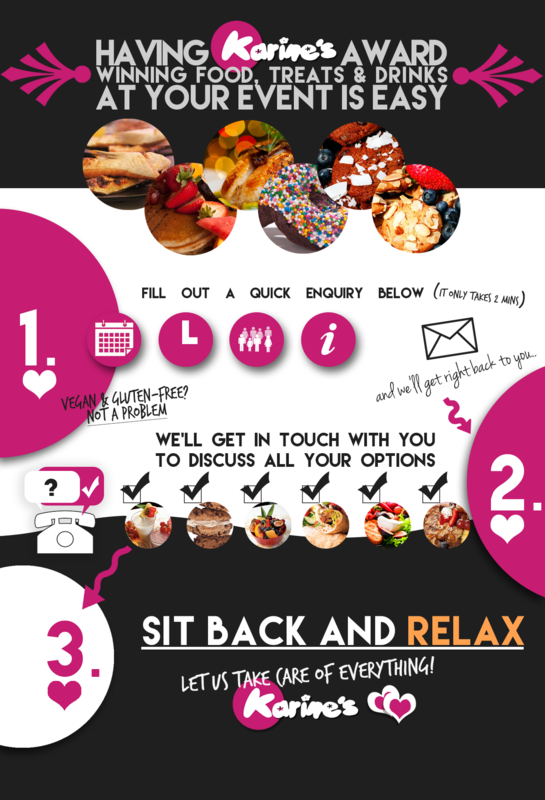 What is the event you'd like us to cater for? Does anyone in your company/group have any specific allergy/dietary requirements? Please provide as much information regarding your event as possible – it’s okay if you don’t have all the details. We’ll work with you to bring you the freshest & tastiest food, drinks and treats at your event. If something changes with your order, you can call us, or email us at anytime! We pride ourselves on being one of the best Catering Services in Toronto, with specialised catered menus for you. 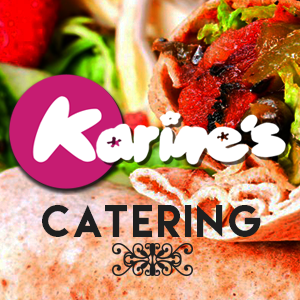 Karine’s Catering can provide you with a wide selection of Vegan and Gluten Free options delivered right to your office or event. Don’t forget to check out Treat by Karine, our delicious range of Vegan and Gluten Free cupcakes, cookies and creams. Just ask when placing your order!